Ruby, an English springer spaniel, is owned by Clare Poyser. 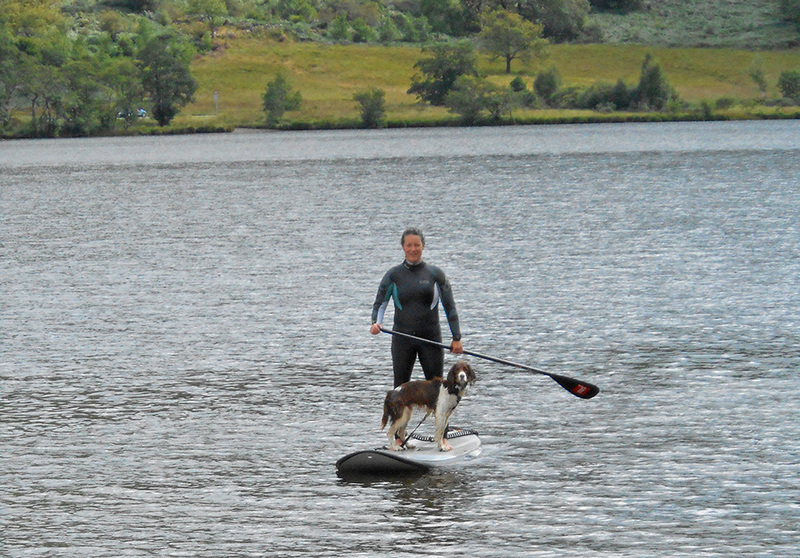 Clare has set up Canine SUP – a Facebook page that brings dog SUPers together. 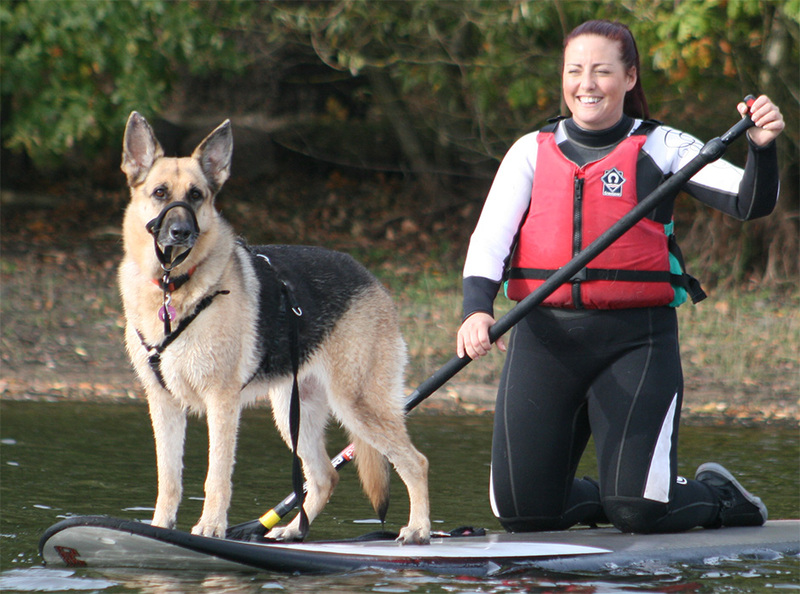 Clare is Dec Poyser on Facebook for those who want more info about paddling with your pooch. A picture paints a thousand words – but for Ruby and I it set us off on a thousand adventures. Whilst bored one night I came across pictures on the internet of some dogs looking like they were having great fun on paddle boards. I looked at Ruby and said: ‘We’re gonna do that’. Ruby raised one lazy eyelid, took a glance at the screen and thought to herself: ‘Geez, another one of those ideas!’ Little did we know then what antics were coming our way. Soon I was booking a SUP taster session on the River Dee with the rest of Ruby’s Adventure Club friends and excitedly anticipating the date arriving. That day dawned and it turns out Ruby was a bit of a natural. Me? Well, I took a bit more time to get used to the boards and being on the water. But at the end of the day when we both lay shattered in front of the campfire I knew we needed more of this in our lives. I wanted instruction and skills to enable us to work better on the board. For me, not being so wobbly and not keep falling off every five minutes. So I signed up for the BSUPA Ready to Ride course at my local club – InlandSUP. This was October and I quickly realised that reservoirs in Birmingham were too cold at that time of the year for a dog. I secretly joined the club alone (she would have been livid if she’d known I was going paddle boarding) and began developing my skills over the winter months. By the time the spring arrived I was ready. We spent a lot of time in those early days figuring out just how this was going to work for us. One of the biggest challenges once Ruby was comfortable on the board was actually keeping her on there! As soon as she sees the paddle board coming off the roof rack she goes crazy, yelping excitedly, her tail wagging so fast it’s a blur and a totally inability to sit still. We spent a lot of time coming to compromises – she gets her swimming time if I get my paddling time. All this required a totally new set of commands to learn. Ruby quickly became the most popular club member at InlandSUP and everyone was keen to paddle with her on board until they realised that when she jumps off, she goes one way and the board goes the other – sharpish! She also has become a bit of a local attraction in Birmingham with people stopping to gaze in disbelief at the paddle boarding dog. So far we have been on some great adventures together; from SUP surfing in Wales, paddling the River Wye, including Symonds Yat Rapids, to exploring local rivers and waterways, and there will be many more to come. The joy of paddling with Ruby is twofold; the enjoyment I get from being out on the water and also seeing the pure delight on Ruby’s face when we are SUPing together. Getting to where we are now has been down to a lot of preparation and training – on both of our parts. In the early days I would spend time with Ruby on the land, letting her get used to sitting on it, noticing that it moved and rocked when she stood on the rails or nose, and generally ensuring she knew exactly what it was. Sometimes it is easy to forget when introducing dogs to new things that they are usually very suspicious – taking the time to be comfortable with the board is key to happiness. Once we moved onto the water it was a totally different ball game and Ruby was in her element, jumping off the board and swimming. It took a while to get her used to staying on board and also for me to get used to having such a dynamic weight moving about my supposedly stable platform. Working with Ruby to enable us to get places took some time; if she had her own way she would swim everywhere but that’s just not possible and would wear her out too quickly, so we slowly build up commands and instructions. We’re not perfect, but it all works for us. One decision I took was that Ruby wouldn’t wear a pet buoyancy aid while on the water. This was for a couple of reasons; one being she just doesn’t like wearing them and another being that she’s a confident swimmer without. It’s a very personal choice that each owner will need to take. She does however wear a harness; this provides so many more places where I can help her onto the board. In the early days we used the club boards and took it for granted that Ruby could climb on fairly easily. When I bought my first board it didn’t have the padded deck like the club ones and Ruby struggled with getting her balance on the board and also climbing back on. After learning how to do it ourselves we arranged another session for Ruby’s Adventure Club friends and it’s gone from strength to strength – in September and October alone we delivered sessions to over 50 Canine SUPers in Birmingham. 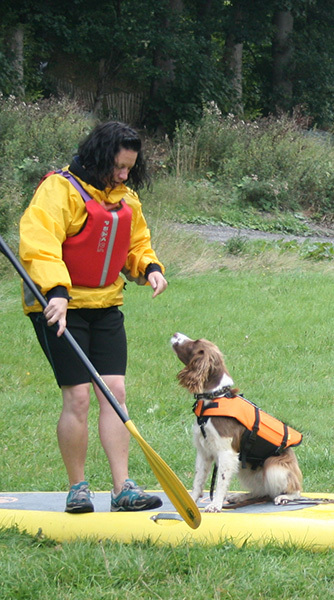 The chances of a positive first experience are vastly improved by taking your time; dogs are used to having four legs fairly well planted on solid ground and to put them onto a board that moves can be a massive trauma.Taking it slow is also important as your paddling develops: allow extra time on long trips for your pooch to enjoy it too. If your dog is like Ruby then a good run before SUPing does wonders to help burn off excess excitement and also brings with it a dog that is a lot calmer. Taking a hound on the water but not letting them in it is like taking a kid to a sweet shop and not buying anything. As long as you have good commands with your dog then letting them swim isn’t a problem. They’ll come back when called and when they need a rest. Ultimately you need to have confidence in your paddling ability to get to your dog quickly, should it run into difficulties. It’s also important to keep an eye on the general welfare of the hound on the water; is it too cold, has it eaten and drunk enough fresh water? Keep an eye out for wildlife too – a duck doesn’t expect a dog to arrive by paddle board. Getting out and paddle boarding is all about stoke and taking along a companion just doubles that. And a free bonus tip? Don’t ever expect to stay dry! I really enjoyed your article, Clare. You did a nice job of summarizing some basic safety tips and I just liked your Canine SUP Facebook page! I’m also trying to educate more dog owners on how to safely paddle with their pooches, and just put the finishing touches on an educational infographic, I think it will be right up your alley! Here’s the infographic, perhaps it will be a helpful add-on resource to your excellent article! Happy paddlin’ and keep up the great work, Clare.